The Fleur De Lis is an easily recognized emblem that has been around for many centuries. If you do not happen to speak French, than you may be interested to know that “Fleur De Lis” literally translated to English means flower (fleur) lily (lis). 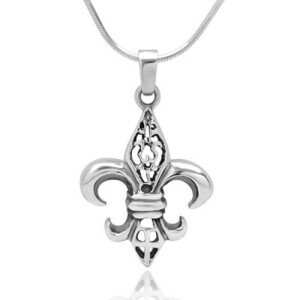 Now, take a close look at the Fleur De Lis pendant. Can you see the lily flower now? The Fleur De Lis symbol epitomizes style and elegance so it is no wonder is it a popular theme chosen by jewelry designers. This page showcases some of the finest Fleur-de-lis pendants available to buy online at reasonable prices. For added interest, you will find some hidden facts about the motif and for your convenience, the pendants are arranged in price ranges with the most expensive at the top. Scroll through to hunt down the snippets of information and enjoy this online shopping experience. Did you know… the Fleur De Lis continues to be used on many modern day flags and official seals? As recently as 2006, discussions continue about it’s use on the flag of Bosnia and Herzegovina – Fleur De Lis in political conflict! This is a stunning diamond and gold Fleur De Lis pendant. It is 14k yellow gold with 0.15kt gem weight in diamond accents and comes on a 14k yellow gold chain. The Fleur De Lis symbolizes purity and light – what a gift to give to someone you love. Among the many interpretations about the symbolism of the Fleur-de-lis, is the belief that, since the lily was the emblem of the Virgin Mary, the motif symbolizes purity of spirit and the sanctity of motherhood. No wonder it is a popular gift for Mothers. This beautiful pendant measures approximately 1.5 inches and features a soft blue topaz with sparkling diamond accents. Did you know… the Fleur De Lis although much associated with the French royal families predates that by thousands of years? It has been uncovered in ancient Egypt and Rome and may have originated in ancient Mesopotamia. Did you know… since armies began many have used the Fleur De Lis on standards on tops of spears and in this contest is usually meant to represent power and strength. This super pendant is suitable for men and women. It is crafted in a traditional way by artisans in Indonesia using chisel and hammer. If you would like to read more about the technique and the people who make these pendants click on the photo link. Did you know… Joan of Arc, the Maid of Orleans, carried a Fleur De Lis before her into battle so it is has become to be closely associated with her and her belief in the Holy Trinity. Did you know…. The Fleur De Lis is known as a stylized form of lily – but it is actually a stylized depiction of a yellow iris which is part of the lily family. Did you know… you can find the Fleur-De-Lis depicted in some form in almost every ancient and modern country of the world. I wonder how many other motifs are so well represented. As you have already seen by the featured pendants thus far, the Fleur De Lis emblem is available in lots of different styles, with quite a variety of embellishments or settings. Here are a few more necklaces that we simply did not want to leave out. From dainty charms, to lockets, and even the more masculine dog tag style, there is sure to be a Fleur De Lis pendant to suit any taste.